1. I learned from real mentors. Natalie was worried about a deduction that the Agency had disallowed and that a client wanted to dispute. She asked me to research any possible way that the deduction should be allowed. I identified that the client could claim the deduction if it were classified a certain way. The research wasn’t anything groundbreaking, but when I met with Natalie to talk about it, she noted that classifying the deduction this way might lead to a further assessment that, while unlikely, could be costly to the client. We wrote out our two potential arguments and listed out the consequences of each. 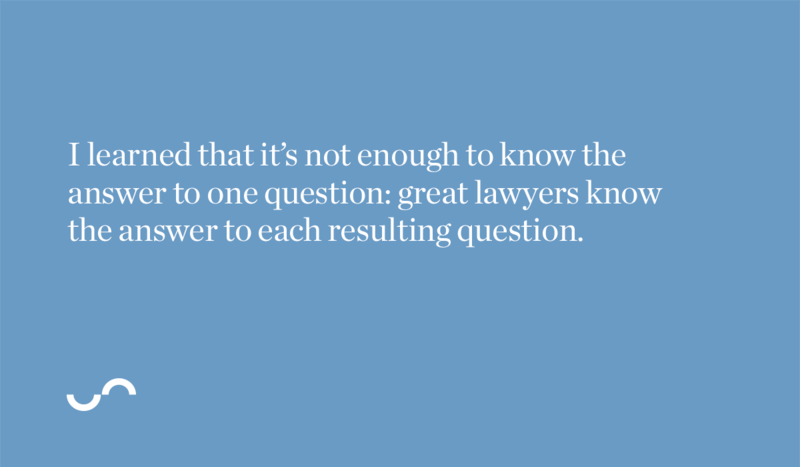 I learned that it’s not enough to know the answer to one question: great lawyers know the answer to each resulting question. 2. I used CounterMeasure to break down a case and develop the right litigation strategy. We are working on a Tax Court appeal where the Agency assessed penalties, increased income, and disallowed losses all based on the “lack of documents” (there were plenty of documents). As we do in all our files, we started mapping out a litigation tree in CounterMeasure that identifies each decision a client will need to make and all the potential outcomes. I needed to identify the financial impact of each outcome. At times, breaking down a case like this can be tedious and time-consuming, but CounterMeasure helps and it really provides a clear understanding of the best strategy, the litigation process, and the dollar value of each issue in the appeal. In the end, we drafted a recommendation to the client that was based on the law, facts, and CounterMeasure analysis. 3. I developed my legal expertise in collaboration with others. We have a weekly meeting where Legal gets together to go over the Tax Court files that we are working on. For each file in the firm, we build a relevance diagram (a simple diagram that sets out the legal test we would apply and an identification of which facts influence which aspects of the test; we colour-code each fact based on the strength of our evidence). 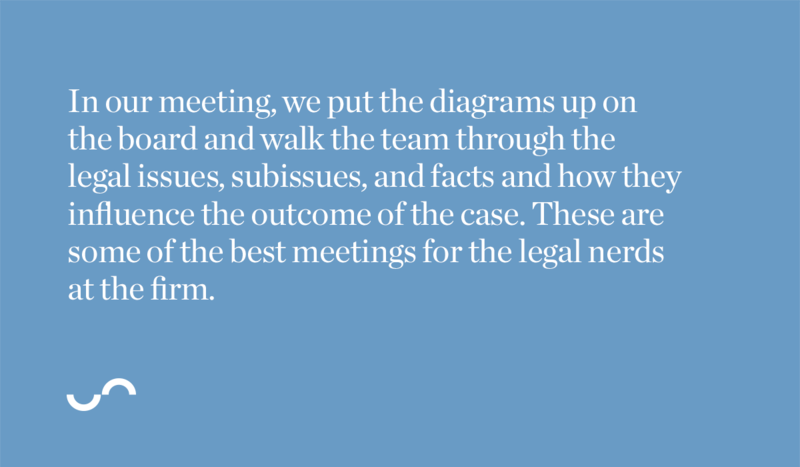 In our meeting, we put the diagrams up on the board and walk the team through the legal issues, subissues, and facts and how they influence the outcome of the case. These are some of the best meetings for the legal nerds at the firm; we get into discussions about statute interpretation and how exactly to break down a “simple” provision in the Income Tax Act. We distill the issues down to the core law and facts and have a meaningful discussion about the impact on the file as a whole. We often joke that we are actually doing what we went to law school for when we’re working on relevance diagrams. 4. I took on a big task without people looking over my shoulder. Yoni assigned me the first draft of written answers to examination for discovery questions. The government asked our client over 400 questions and requested an ungodly number of documents. I coordinated with the client to request the documents and have them answer the questions we couldn’t. We completed the answers only for the government to ask a further 200 questions. 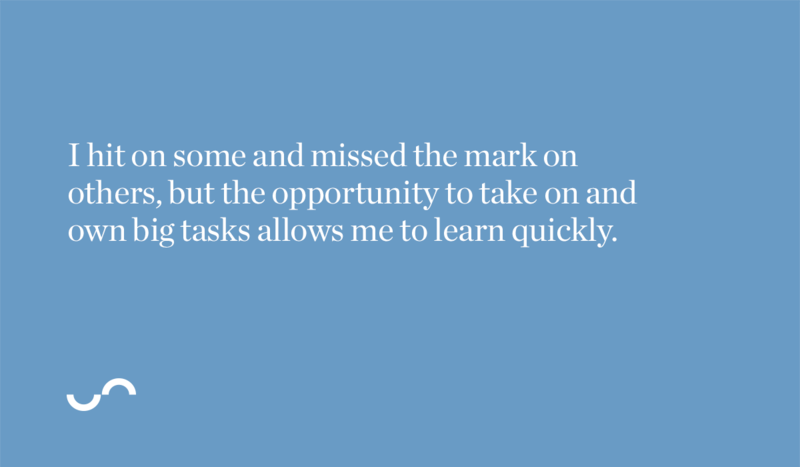 I hit on some and missed the mark on others, but the opportunity to take on and own big tasks allows me to learn quickly. I also learned that next time I see this lawyer’s name on the other side, I would vote heavily against written examinations. 5. I experienced real efficiency. I was at the office late twiddling around with something and watching the Leafs game on one of the big screens in the office (mostly watching the Leafs game) when Peter got an email from a client who wanted to file a voluntary-disclosure application. Peter had all of the client’s information and had been speaking to the client over the past couple of weeks, so we had everything we needed to draft and file the initial application. Peter sent me a quick message and said that it would be cool if we could get the application out before the client even got up for work the next day. Using our workflows and document automation, I had the initial application prepared within 30 minutes and sent it off for review, and we filed it before the first period of the Leafs game was over. The ease and efficiency of getting some things done is staggering. 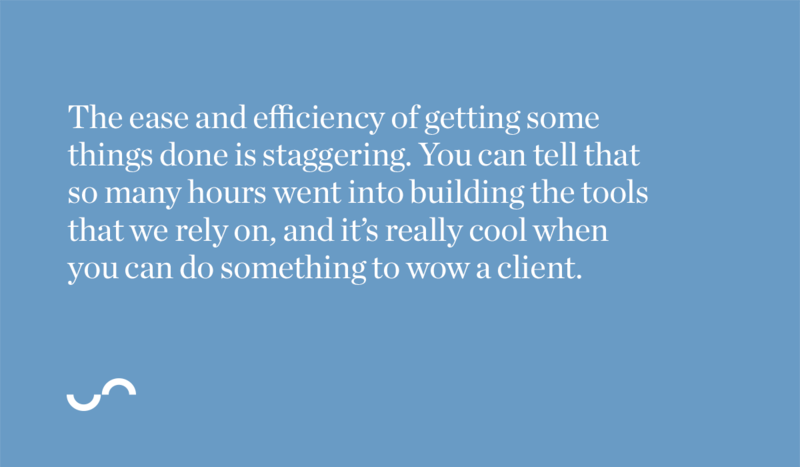 You can tell that so many hours went into building the tools that we rely on, and it’s really cool when you can do something to wow a client. 6. I enjoyed the freedom and flexibility of our “one remote day per week” policy to get some stuff done, in my pajamas. I was revising a draft article the firm would be publishing later in the quarter and doing the legal research underpinning our analysis. I worked from home so I could burn through the case law and statutory commentary research – work reminiscent of late nights in the library in that last week before a paper was due in law school. 7. I played with numbers. 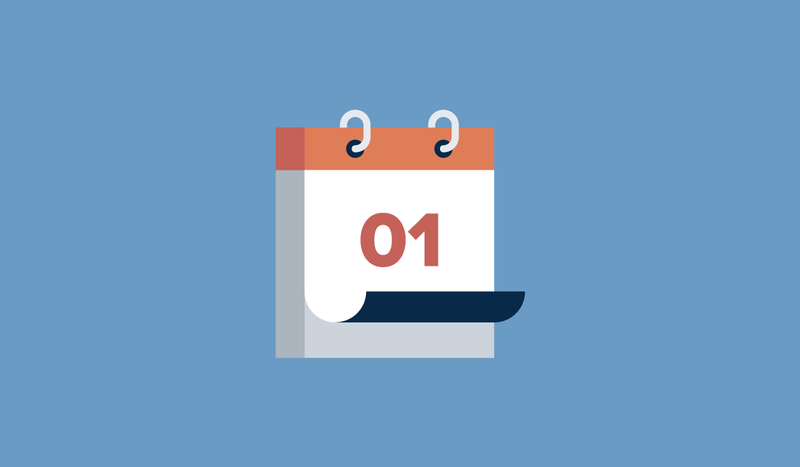 We knew that one of our clients would likely end up paying a portion of the tax and penalties on their appeal, and we had told them that we would try to identify the amount that they should pay right away to prevent interest compounding daily on the tax payable. I broke out the Excel sheets and the calculator, ran my calculations by Natalie, and emailed the client with our recommendation. I have always liked math, but when it comes to playing with how the Agency calculates interest, it can get complicated. It gets easier over time, though, and I’m starting to find it almost fun. 8. I got edited and learned how to improve my writing. I took the first crack at writing submissions for one of our objections files, reviewing the evidence, doing the research, and piecing everything together into a persuasive whole. Substantively, the submissions were straightforward – but that didn’t stop our legal editor from returning my draft with dozens of edits and questions. The revisions helped me see where I could strengthen my arguments and writing and where someone who’s completely unfamiliar with the case might get confused. 9. I helped Counter spread its tax expertise. Yoni asked me to review a recent Supreme Court of Canada decision discussing judicial review. We had worked on a judicial review article this past summer, so we wanted to make sure that the case did not change our understanding. Yoni and I agreed that the decision didn’t change our understanding, but Yoni raised some questions that we hadn’t considered. We agreed that we would set a task to update Hank (our knowledge database) with our questions to ensure that our questions would not get forgotten before the next time we needed to rely on the information. 10. I learned to go all the way to build cases – the right way. Natalie asked me to review evidence that a client had sent us to establish their residence during a particular period. I went through the client’s bank statements line by line, charting where the client made purchases to establish that they did, in fact, live where they claimed to live. Although not the most glamorous type of work, I know that if we take the time to accurately present this evidence in a way that’s easy to digest, we’ll increase our chances of success. 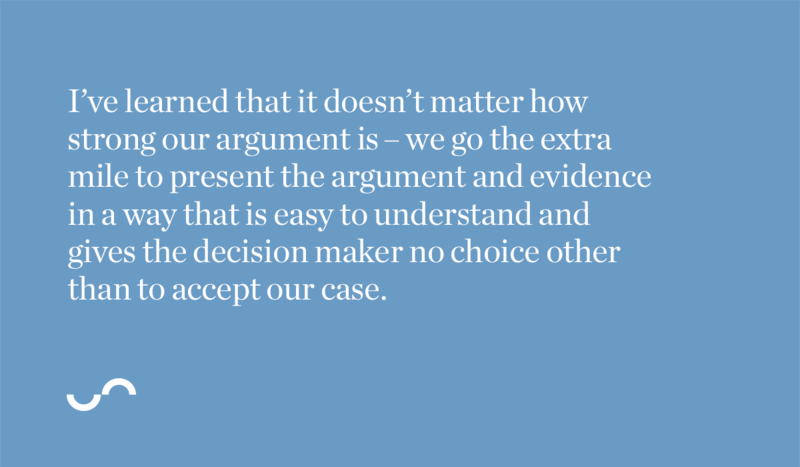 I’ve learned that it doesn’t matter how strong our argument is – we go the extra mile to present the argument and evidence in a way that is easy to understand and gives the decision maker no choice other than to accept our case. That was just one week, not even the best one. I want to be a great tax litigator, but Counter really provides an enviable opportunity to become much more than that. Working here is like learning the process from Sam Hinke before anyone trusted it. What you learn from the people here is invaluable. I never even have to leave because Counter hired me back. And that means that I get to have insanely interesting and weirdly awesome weeks for the rest of my life. We have no choice but to build this law firm, this way.